I’m locked and loaded for May 2 through 6. Hold off on making reservations until about a week before. Morris Point told us to wait until then. I am hoping to go, when will we know the dates for sure? Ill go in on a cabin bigfish. I’m out of NE Mpls. I’ll be there may 3-7. I am also interested in hopping in the truck with someone that can take me and my gear (hobie outback) for gas money and company. I am out of Lakeville. I’m happy to be part of a cabin if there are openings needing filled. No on reservations now, I would wait until we know ice out timing better. We watch Zippel Bay resort. They have a pike tournament the first weekend the bays are iced out. They sometimes change the weekend if ice out is late or early. I saw a post the Rainy River is opening. Our dates are scheduled for May 3 which is a Friday. Most people are thinking that is still looking pretty good. It’s off season at the resort. We were the only ones there last year. Should we reserve space at the resort now, or wait for more details? OneBigFish, where do you live? We’ll be watching ice out timing close now. I am 100% in but need to have a trailer to join with my 11 footer. Anyone want to get things together to get a cabin set up? I can pull a trailer if you don’t want to use your vehicle too. Catch me here or on Facebook. It’s going to be interesting to see how ice-out goes this year for sure. We’ll watch Zippel Bay Resort. They have a pike tournament the first week after ice-out. We match their timing. I was talking with someone who thought all the snow melting will put downward, heavy pressure on the ice cause it to break up. Fingers crossed! I’m starting to get really curious about when ice out will be. Hope this doesn’t have to get pushed back! This sounds fantastic! I want in. Keep me posted with deets! I’m tentatively in. I’ve already signed up for the 1st 2 tourneys. Let me know when we need to book rooms or how this works. It will be just me on this trip. With my wife not going. Devs429 my kayak trailer hauls 2. Depending on what you have, you’re more than welcome to throw it on my trailer. I’m new to the group and would like to learn some Pike techniques. Ive only caught them spinners. I grew up on Oklahoma large mouth and obviuosly catfish. And yes I did noodle for them too. I’m tentatively in. I may be going to FL for a couple weeks in April plus the opener tourney plus possibly the Vibe tourney. It’s possible my cat won’t even recognize me after that. Anyway, I do have a 16′ enclosed trailer for yaks and gear if that works out with anyone heading up for the same days as me. All providing I don’t sell my house and move south in the meantime. I’m tentatively planning on attending this – sounds awesome and would be the furthest north I’ve ever fished. Question for the group – does Hi Tempo or elsewhere rent kayak trailers? I’d prefer to trailer mine/others vs. my typically roof rack method for such a long drive. Can’t wait. This was one of the best fishing trips I have ever been on. Was such a great experience. This sounds really fun ! Can’t wait to get more details etc. I am TOTALLY IN on this trip this year!! Happy New Year ! This sounds like a cool trip. fyi, I posted a couple of “how to” videos on Kayak Musky Central last month. I am planning one more in the series but it will wait until Spring. Best wishes and tight lines. 1) Don’t let the lake scare you. 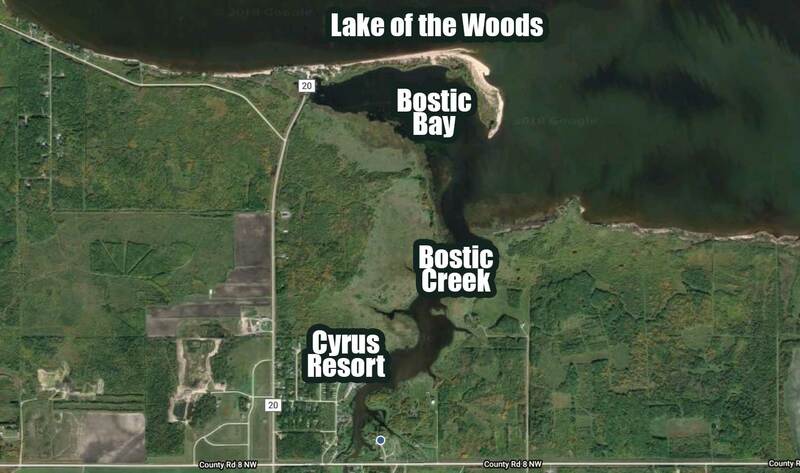 Bostic Bay is a small, protected area. Last year we were able to get out of the wind easily. We also only saw 3 other boats at any given time while we were out there. 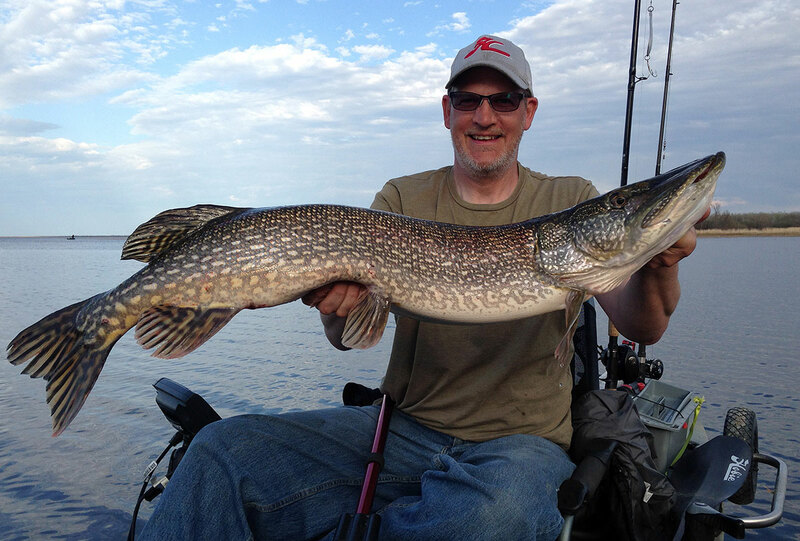 2) If Zippel Bay Resort does not have their tournament going on, we can also head over and fish Zippel Bay for pike. 3) Cyrus Resort is a great resort with reasonable off-season rates (I think it was $45/person/night plus tax last year). I was also told by the owner that she is pretty sure that the restaurant will be open while we are up there in spring. 4) Even if you are a novice pike fisherman, there will be plenty of members that are willing to help you out with tips and tactics and what gear to bring. I will change the dates for the week before. You are correct. Thanks! I’m wondering about the dates you have listed. It’s currently over opener weekend and I don’t think we will be able to get rooms then. I know they are tentative, but I was thinking our best bet would be the weekend before opener. Ask questions or leave comments. Let us know if you’re interested in this trip.